And now, things are beginning to pile up… I still need to fiddle with Sorrento Sunrise for the RNA submission and i have 2 short stories i need to work on for an anthology thats being put together by my writing group. Im feeling totally uninspired to do any of that, because i have a little spark in my stomach…a small flicker of something thats telling me the urge to write is coming back, but i need to catch it. If i ignore it (which would be very easy to do) it will disappear and possibly not return for months. Soooooo….ive decided to join in with the A-Z Challenge 🙂 And this year it will be totally fiction lol. I loved doing the characters back in 2012, so this year i’ll be posting a piece of fiction, every day, prompted by a word beginning with that particular days letter of the alphabet. Ive already got my words (i used an online random word generator) and some ideas are starting to form for A & B lol….but i haven’t written anything, it will be done live, daily, thats the point…to get my brain working on a daily basis. So i guess i’ll see you, back here, bright and breezy on the 1st of April…exciting! 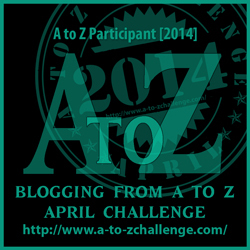 Are you taking part in the A-Z Blogging Challenge this year? This entry was tagged A-Z Challenge, Blogging From A-Z Challenge, Creative writing, Inspiration, Note Book, Writer, Writer Resources, writers, writers block, Writers Resources, Writing, Writing Exercises, Writing Prompts. Bookmark the permalink. Awwww, honey, why no blogging? Oh boy, that is a good question for which I do not have a good answer! Oh, excellent! What are you doing? Delighted to see you back again Vikki. I was afraid you’d emigrated. I know the feeling…. This year has been all about the teeth pulling when it comes to writing. In any case, good luck! In my case? I admin for a fiction writers group of 4,000+ members, and am currently organizing a massive anthology project, plus helping another person with their similar project, haha… I’m doing too much “admin”, “under the hood” stuff to be able to focus on writing…. Luckily I signed up for a charity anthology, so I started writing for that today. Good luck honey, sounds like you have quite a bit on your plate! Good luck to you too! You can do it. Sometimes we just have to scrape the crust off and power through. You know I meant Baking? Stupid predictive texting! Great to see you back at the writing desk. Good luck in the challenge. Glad you’ve found a way to get your back in touch with your writing mojo! I’ve been very lax of late with blogging but have some fantastic new content to add now so I’ll be starting it up again shortly, right after my book hits the virtual shelves next week. Oooooo, exciting! Good luck with the book honey! I’ll definitely be checking it out. The thing is, you can’t force it, because if its boring you, it will DEFINITELY bore your readers 😦 Hope to see you back blogging soon honey. Hi Sydney *waves* how are you honey? Oh wow, that’s exciting!!!!! 🙂 good way to promote it! Sorry for spelling you name wrong. Out of practice. You’ve been gone so long. haha. I can’t wait to read your A to Z random stories! I thought about doing it this year, but I’ve got too much going on with the day job. 😦 I’ll be following along, though! Have fun! Hi CB! How are you honey? sounds good – as you know I’m doing the challenge also – see you April 1! As you know I am doing the challenge too – see you April 1! Welcome back, honey! I take my hat off to you–from exhausted writer to enthusiastic A2Z blogger, wow! Good luck, and I’ll look forward to reading your posts again. Rock on, Vikki!